A couple weeks ago Meredith Fineman’s “Please Stop Complaining About How Busy You Are” appeared in a gazillion media sites. Its timing was perfect in relation to a graphic design project I was doing. Others must have been thinking the same thing because Rebecca Ryan wrote “Are You Really That Busy?” for Madison Magazine and Tim Kreider wrote “The ‘Busy’ Trap” for the New York Times’ Opinionator (actually Kreider wrote his article a year ago, but judging by the 813 comments it received, he hit a touchy nerve back then too). Basically, these articles chide us to just stop. Stop out-doing each other with our busyness. Stop filling our days with self-imposed busyness. Stop wearing our busyness like a badge of honor. I’d like to add one more to the list: Please, stop thinking your busyness is more important than anyone else’s. In other words, stop thinking it’s okay to neglect your responsibilities because you’re “just so busy,” yet still expect others to uphold theirs. Ouch. A bit of snarkiness there, eh? Here’s the thing. Like the authors above said, we’re all busy. The stay-at-home parent is busy. The working parent is busy. The unmarried employee is busy. The married business owner is busy. Young students are busy. Older retirees are busy. No matter how you rearrange these descriptors, everyone is busy. For any of us to think we’re busier than someone else is silly. To think our busyness holds priority, thus making it a justifiable excuse for anything, is narcissism. Yet we’re all guilty of this. I do it to others. Others do it to me. So, I certainly don’t want this post to be a rant. And I don’t want my clients to think poorly of me. Instead, I’m following this article’s instruction; I’m offering some education on the theory of cause and effect—how clients’ busyness can sabotage their own projects. Client XYZ doesn’t meet the agreed-upon deadline for fulfilling her responsibility for the project. Her delay causes a snowball of effects: 1) the designer has to rush to complete the job in the required time frame, which then costs the client more money; or, 2) the designer can no longer complete the job in the required time frame, which then delays the next vender, like maybe the professional printer, who very likely has scheduled the job for a specific date. Lastly, 3) the overall quality and timeliness of the project is compromised. I’d like to educate my clients of this: You control important outcomes of your project. You affect it’s quality. You affect how, together, we meet your deadline. 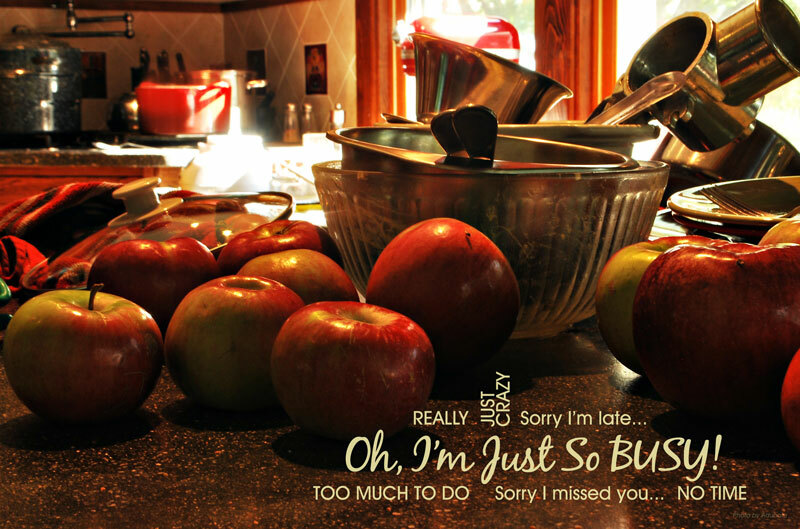 Don’t let busyness cause you to mismanage your responsibilities. I want your project to be the best it can be.